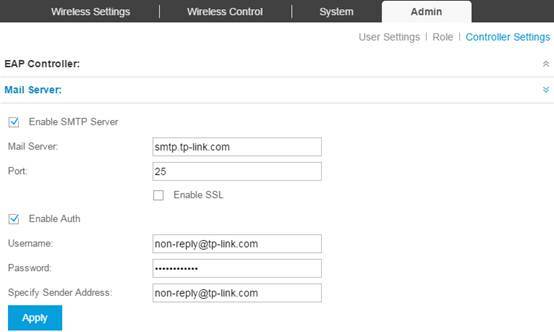 TP-Link Community > Knowledge Base > What if I forget the password of EAP Controller? EAP Controller provide different access privilege for different roles (administrator, operator and observer). 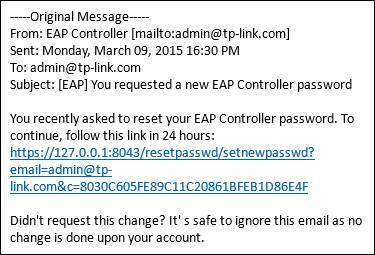 If you forget the password of EAP Controller, you can follow these steps to retrieve it. Case 1 If you forget the password of observer or operator, you can ask the administrator to modify it in Admin-- User Settings. Case 2 If you forget the password of administrator and the EAPs are still able to access to internet, in the circumstances you may retrieve the password via the Email of administrator. But before you can use this function, you need to finish the following settings first. Go to Admin -- Controller Settings à Mail server. Fill all information required in this page and click on Apply. This mail server is used for sending email to the administrator’s Email address to reset the password. When you try to retrieve your password, it will ask for the email address of administrator to check if you are the administrator. If the Email addresses are not matched, you will not be able to retrieve your password. You can check and modify the email address in Admin -- User Settings. 1. 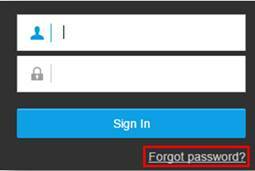 Click on Forgot Password now. 2. Fill the administrator’s email address in the box and click on Reset Password. 3. If you fill in the correct email address you will receive an email like shown below. 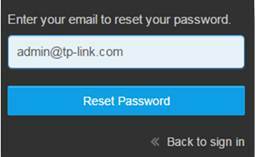 Click on the hyperlink you will be able to reset the password now. Note: If you are not on the host which EAP Controller is installed, you need to change the IP on the hyperlink. Another way to avoid this case is to set the host in Admin -- Controller Settings -- EAP Controller. You can even change it to public IP address if you are remotely controlling it. Refer to Q10. Can I manage my EAP network from Internet? to learn how to remotely control your EAP network. Case 3 If you forget the password of administrator but can’t retrieve your password in case 2, most likely you didn’t set the mail server or you forget the email address of administrator, you need to uninstall the software and reinstall it. This would be the last choice.